People searching Southern Utah real estate that are outdoors enthusiasts, enjoy hiking vs. shopping, would rather ride a bike than drive a car, enjoy climbing and repelling and want to view the peaks of Zion National Park, belong in Springdale. 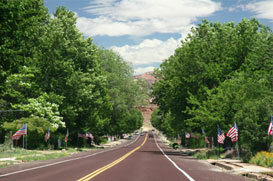 This Zion community includes Rockville, Virgin, Zion, and Springdale. This community affords close friendships of nature and animal lovers. A property in this community affords the owner less than 5 minutes into Zion National Park, and less than 2 hours to Lake Powell and The Grand Canyon. If you feel the need to do the occasional Costco run, you’re only 35 minutes to St. George.